Dolly Louise (Kennedy) Morris passed away Sunday September 9, 2018, 7:08 a.m. at the OSF St. Mary’s Medical Center in Galesburg, IL. She was born Saturday November 19, 1921 in Beardstown, IL the daughter of Claude Lavelle and Mary Ella (Davis) Kennedy. She married P.J. Morris on December 30, 1960 in Galesburg, IL; he preceded her in death on August 27, 2003. She is survived by one son: Charles “Ed” (Marcena) Austin of Alexis, IL; two daughters: Peggy J. (Terry) Stevenson of Galesburg, IL and Mary Ann Beck of Washington, IL; one daughter in law Alice Austin of Galesburg, IL; 13 grandchildren, 21 great grandchildren and 16 great-great grandchildren. She was preceded in death by her parents, husband, 1 son (Darold E. Austin), 2 brothers, 3 sisters and 1 son in law (Lynn Beck). Dolly was born and raised in Beardstown, IL and graduated from Beardstown High School in 1939. She worked at Gale Products in Galesburg for 28 years, retiring in 1981. 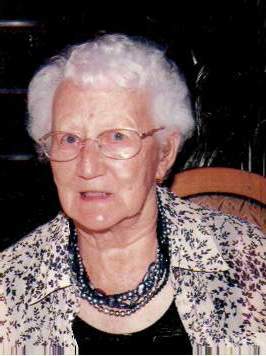 She enjoyed crafts, knitting, crocheting, crossword puzzles, and reading. She was a member of the Gerlaw Christian Church, Christian Woman’s Fellowship, Woman’s Club of Alexis, and Retirees of Gales Products. Funeral service will be Thursday September 13, 2018, 11:30 a.m. at the Gerlaw Christian Church. Visitation will be from 10:30-11:30 a.m. at the Gerlaw Christian Church. Burial will be in the Gerlaw Cemetery Gerlaw, IL. Memorials may be made to the Gerlaw Christian Church. Please sign the online guestbook at www.wisefamilyfuneralhome.com. Wise Family Funeral Home Alexis, IL is in charge of the arrangmements.